Geddy Lee Discusses Feedback, The 30th Anniversary Tour And More! As Rush neared it's 30th Anniversary, a tour began to take shape that would help celebrate the band and their music. The band members, a little concerned about the idea of hitting the road without an album to support, ventured into an area most fans would have never thought; a covers EP. Comprised of eight tracks that inspired vocalist and bass player Geddy Lee, guitarist Alex Lifeson and drummer Neil Peart as young musicians, the EP shows a different side to the band. Raw and dripping with a controlled abandon, the Canadian trio tear through classics from Cream, The Who, Love, The Yardbirds and Buffalo Springfield. While paying homage to the songs that inspired them, they also bring new twists and indulge themselves by making their versions unique and with a distinctive Rush flavor. An EP, a 30th Anniversary tour, and a live DVD released last fall prove that they're hardly resting on their laurels. I spoke with Geddy Lee before soundcheck in Mountain View, California in early July to discuss the new EP, the tour, the future, and the importance of good footwear. How did the seed for Feedback germinate? A very good friend of mine, one of my closest friends, suggested it to me. It was the kind of thing that came about very slowly. He suggested it to me and I thought about it for a while and I thought "y'know what, maybe it would be a fun idea" and I ran it by the other guys. They both responded positively rather quickly and we approached the whole idea in a kind of "nothing ventured nothing lost" way. We thought, "well, we'll just play around with these songs and if they turn out great fine and if not, then fine too, we don't have to release them. We can throw them away." Because nobody knew it was coming there was nothing expected from us. We took a very casual approach to it. Did you primarily select songs that you'd played in different bands prior to Rush? Yeah, that's true for the most part. They were either songs that we played or songs that we used to listen to or songs that we wished we could play. That was the criteria. I know that Vapor Trails was very meticulously pieced together and took a long time. Was Feedback recorded in a more relaxed setting? I heard that you'd recorded together for the first time in a long time. It was very different then Vapor Trails. We all set up in one room basically and played live and it was really very relaxed and very spontaneous. The bed tracks came together incredibly quickly. The songs are much easier than they seemed 30 years ago. It was actually very different than Vapor Trials. The whole thing took three weeks. As opposed to 14 months [for Vapor Trails]. Vocally on Feedback there are a number of different arrangements to that of the originals. Was that to fit your range or to put your own stamp on the songs or a combination? It's kind of a bit of everything. You can't go in with the idea of just copying a song directly, although "The Seeker" is really not that different, there are a few changes, a few different dynamics and a few different harmonies floating around there. You need to make the songs your own in one way or another otherwise you can't really sing them convincingly. Once we put the initial arrangement together I played around with what suited me in terms of singing that song. You're playing about half of them in the live set - how is that going over? They're a blast to play. I love playing them. I wish we could play them all. 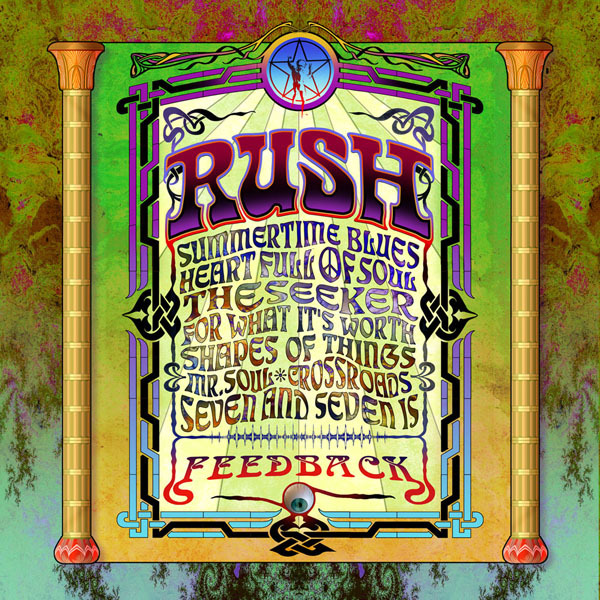 But there's a fine line in my view with what Rush fans want to hear and what we want to play. To lose four songs that people have been waiting to hear from our previous albums in favor of four cover songs is a jump enough, but to do four more would start boring them. People are digging them. I think they're kind of a breath of fresh air in the set to be honest. Do the last two in the encore sort of fill the role that "In the Mood" used to play to lighten things up a bit and break up the intensity a bit? Yeah, it has an intensity of its own, but it definitely feels like party time. How did the instrumental medley from the first six albums that starts the show come about? Whose idea was that? That was an idea that Neil had. He suggested that maybe we could pay tribute to those songs in some way other than...obviously we can't play as many songs as we'd like to, we're already well over 3 hours. So in rehearsals, actually quite late in rehearsals, we decided to throw a bunch of them together and see if we could make some sort of overture. So we came up with this "R30 Overture" idea and worked on it. It came together quite quickly actually. I think it's a nice way to open the show. It's really easy to pull songs together if you don't have to sing them. It's like a walk in the park. "Between the Wheels" hasn't been played since the Grace Under Pressure tour 20 years ago - whose idea was it to bring that one back out? That was my idea. I put a list together of songs that we could play that had disappeared from view for quite a while and that was one that everybody gravitated to pretty quickly and once we played it once live we knew it was gonna be perfect for a concert situation. It's a real highlight of the show for me. The production seems to be pretty intense for that track as well. Yes, it is. It's really a cool moment in the show. On the Vapor Trails tour you had a revolving set list. Do you foresee any additions or modifications to the set list as the tour progresses? Well, we worked long and hard at perfecting these two sets and at this stage we're reluctant to do any changes, but as the tour goes on it's possible we might flip things around once we start getting bored. "Resist" was a highlight for me and the emotion that came over the crowd in Hartford on opening night of the Vapor Trails tour was palpable after Neil's solo. To have that emotion then carry into the stunning acoustic version of "Resist" was just amazing. I know that "Nobody's Hero" was tested for that tour, but you went with "Resist" as the acoustic piece. I was wondering if there were other tracks that were discussed or even tried for the acoustic portion of the show. No, we talked about things. There was talk about doing "Second Nature" as an acoustic song - I think that would be a good treatment for a song like that. Again it's a question of time. I'd love to extend the acoustic thing to be half-an-hour long, but I don't know if we could justify that in the context of all our material. You've mentioned in the recent past that a box set might be in the works. Is that still on the back burner? Not really. We keep getting distracted with these other projects. Certain things like the DVD of Rio came out and a lot of that contained things that we would have put in a box set too, like the documentary and the easter eggs and things like that. So it's hard for me to visual exactly what that box set would be, but I still have some ideas cooking. We'll put something together one day. I spoke with Andrew MacNaughtan before the Rio DVD was released and he told me that he'd bugged you guys for years about doing a documentary/behind-the-scenes piece with you, but that you guys didn't think you were interesting enough. Then the Brazil trip was a perfect opportunity to document the tour and once in a lifetime trip to South America. What were your impressions of Andrew's documentary after you saw it the first time? It's a bit long for me, but in general it was pretty fun. It showed a lot of what life is like on the road and certainly there was something about that tour that had a unique flavor about it and I think he captured that pretty well. It was a treat for fans to see a bit of behind-the-scenes and to help understand how special that trip was for the band. And I think it's important that fans understand how important my running shoes are to me. Speaking of running shoes, it seems as though the Chuck Taylor Converse sneakers that have been a staple of your on-stage gear have been replaced by Puma's on this tour. Well, I kind of change them up. I don't wear the exact same ones every night. But I found a pair of Puma's that are perfect for using on pedals. It's really all about the pedals. They have to be pretty slim and they have to have hard bottoms so that they can trigger the pedals without breaking my foot. You've always played a key role in the production aspect of the tours. How did the current design evolve? Well, we started having meetings about six months before the tour. It was last December that we started our early production meetings, just gathering the team together. The first step is putting a team together and finding the right creative people and artists and then we brainstorm...we meet once a week for a couple of months and start throwing visual ideas together - films, concepts together and we experiment with storyboarding different things out to see how it will work. At the same time I'm trying to keep all of that in mind while we're shaping the set so they kind of work hand in hand. Certain songs I know we'll be playing that we can get working on right away. Sometimes you're shooting in the dark, you don't know if that song will end up in the set or not. Sometimes you develop visuals for a song and then you throw the song out and then you have these visuals that you try to apply somewhere else. Sometimes that doesn't work, but that's really the nature of the beast itself. It takes a long time to coordinate everybody and everything, but at the same time it's really a lot of fun. I've seen a number of shows in my day and the production that you and Howard and the rest of team put together is one of the finest. Thanks. We take pride and we spare no expense at trying to put something across that's gonna make people smile and at the same time include an aspect of it that is as beautiful as we can make it. Your brother Alan [Weinrib] helped out again for this tour on some of the visuals is that correct? Yeah actually, he had a much bigger role this time around. He oversaw the entire production role, film elements. He was in charge of the budgeting and managing right until the very end. It's actually the first time we've had every piece of the film elements finished and ready to go before the tour started. Usually we're playing catch up half-way through. He did an amazing job. Do you ever watch the show back either during rehearsals or the tour to see the full production in action? I see [the elements] as they're coming together. I don't really get to see them once they're put together in their final form, because that would require filming the show and playing it back to me. So I see it in snippets but I don't really see it in totality. You're playing some new or interesting places on this tour. Your first visits to the Hollywood Bowl and Red Rocks, plus a return to Radio City Music Hall. You were in Colorado last week at Red Rocks - what did you think of the venue? It's an amazing location. One of the most beautiful concert venues in America...or anywhere. I would hazard a guess that it's one of the most beautiful anywhere. It was great, I was happy to do it. Looking forward to returning to Radio City after over 20 years? Yeah, it should be fun. I'm looking forward to it. Granted the Rio DVD just came out last year, but are there any plans to document the 30th Anniversary tour on DVD? Not at the moment. I think it's a little close to Rio. It's gonna be hard to justify a back-to-back DVD set. On the Roll the Bones tour, you started to improvise certain portions of songs for the first time in your careers. Was that something that evolved naturally or was there some other factor? It began spontaneously, we never really discussed it. And now pretty well every time we play "By-Tor" or "Working Man," even "Crossroads" for that matter, all those middle sections are a little bit different every single night. And we never discussed it, we just let it happen. We have a rough structure for them, but we just let them be. A tough question I know, but what are some particularly special moments for you over the 30 years you've been together? Wow. That's hard to do. I think the first time we played London was a special gig. The first time we played Madison Square was special. I think on this tour Red Rocks was special. The Hartford show from the last tour was one of my favorite memories. Y'know, certain gigs stand out. The entire Brazilian trip will always be remembered fondly. They were amazing. You're finally headed back to the UK for some shows. That must have you guys excited. It looks like they're ready for you with a number of sold out shows already. Yeah, pretty well the entire British part of the tour is sold out. The Holland show is sold out. Sweden is sold out. We've got about 8 or 9 sold out shows so far. With the 30th Anniversary tour looming, did you ever think "I should bring back the ol' Rickenbacker"? Never. Not once. [laughs] I'm too in love with my Fender to not play it. Toronto has always been special for you, what did it mean for you to play SARS benefit for almost half-a-million people in your hometown? That was really quite an amazing moment. I couldn't stop smiling looking out and seeing people as far as you could see. And it went off really without a hitch. It was a great day for the city. We were in the middle of holidays when we got the call to do that show. It was kind of fun to try to throw everybody together and rehearse for a couple weeks and just play for 35 minutes. It was a bit weird. What do you still get off on playing live? Pretty well everything in the set right now I love playing. Obviously it's more fun to play stuff you haven't played so often. You get to a point where you're just happy to play them properly and if you do that then you get off on it. When you're looking out at the generations of people in the crowd, what are you thinking? I'm just amazed. I'm really taken aback every night when I look out there and I see the variety of people that come to our shows. I'm always surprised. After working so very hard on Vapor Trails, most of the interviews after that record was released were about the length of time it took to complete the album. What are your thoughts on it now that there is some distance between that length process. I think it's an awesome record. I'm very proud of it. I think it's one of our most intricate pieces of work. I really love that record. What does the future hold after the European tour? A break and then back into writing some new material hopefully? Yeah, I think we'll hopefully take a break and then head back in to do some writing. Thanks for your time Geddy. Continued success with the tour and the next 30 years! Thanks, it's been nice talking to you.